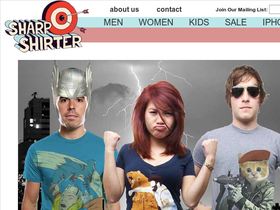 Sharp Shirter, online at sharpshirter.com, was founded by Dan Lachman in 2004, the same year his dad told him to stop playing videogames and do something productive with his summer. What started as a way to keep his father off his back has now blossomed into an expansive company that offers much more than just t-shirts. Now selling in 60 stores worldwide and with a range of over 100 products including laptop and ipod skins, Sharp Shirter has become a full-time job. 58coupons has the best Sharp Shirter deals with coupons, discounts and promo codes. Get 20% off iPhone case from Sharp Shirter with this promo code. Click link for details. For a limited time Sharp Shirter is offering low rate shipping of $5. Click link to take advantage of this offer. Save 10% on Shapr Shirter orders when you use this code at checkout. Click link and start shopping. Buy an iphone case from Sharp Shirter and pay only $14.99. Follow this link to see the selection.